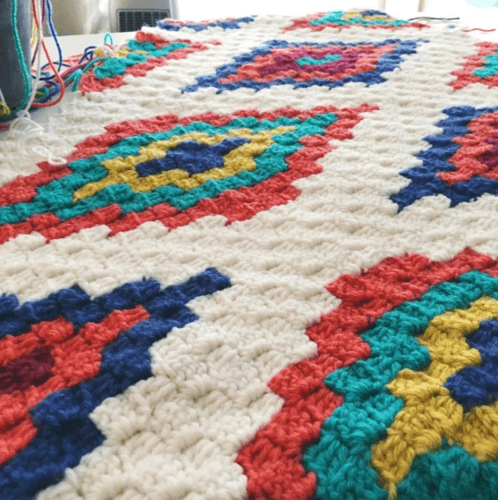 This article will teach you how to complete a corner to corner crochet project with confidence. We have used the Southwestern pattern as an example, and I must say this is one awesome design. There is a video included that illustrates step by step how to crochet a corner to corner blanket. A couple of weeks ago I stumbled upon the loveliest corner to corner crochet afghan you’ve ever seen. This pattern was designed by Stuff Steph Makes. 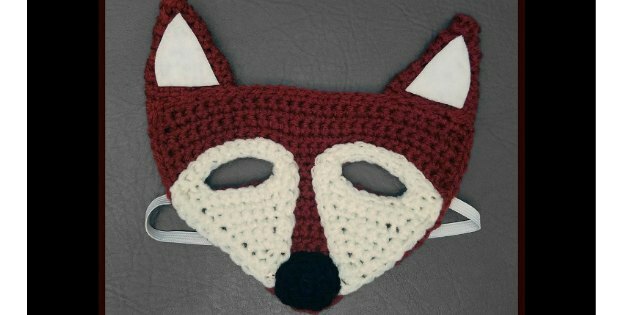 Being the curious crocheting enthusiast I am, I set out to replicate the same results only with a bit of a personal twist. Corner to corner afghan patterns and throw blankets are all the rage right now. And it’s not hard to see why. I’m telling you, you’re going to fall in love with the idea of crocheting designs in an exciting new way. 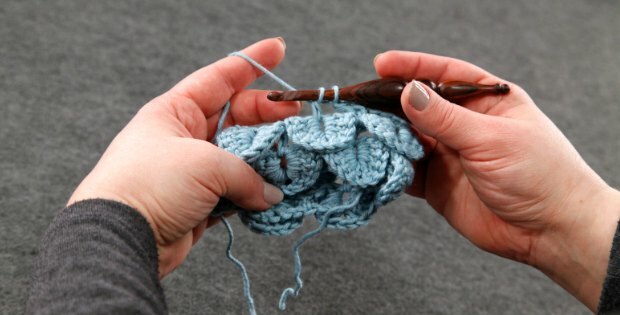 For beginners or knitters who are unfamiliar with the corner to corner crochet, there are plenty of web resources you can make use of to create some stunning pieces for your loved ones. What Is A Corner To Corner Crochet Pattern? The corner to corner crochet pattern is a well-loved crochet style which makes use of graphs to make beautiful patterns and designs. 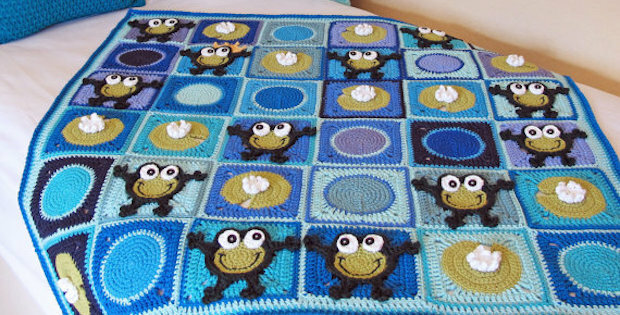 Corner to corner is a crochet style which uses graphs to make patterns or designs in the crochet, arranged into small blocks. It’s often used to create very colorful or pictorial designs. 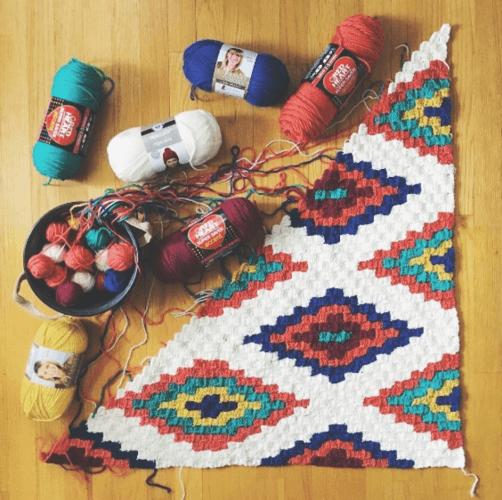 Usually, you don’t get a full line by line tutorial as you might for a regular pattern because the stitch is easy and repeats for every block. But you do get a graph which shows which block should be in which color. Sometimes the corner to corner blankets are called ‘graph-ghans’ because you follow the graph to make them. These can be arranged into small blocks to form any of a variety of pieces you can create which include Afghans, baby blankets and warm clothes you can slip into during cold weather. The pattern is often used to create colorful pictorial designs that will most assuredly turn heads everywhere you go. You can use your kids’ favorite colors as a corner to corner crochet inspiration. You will have some much fun crocheting the corner to corner crochet pattern. 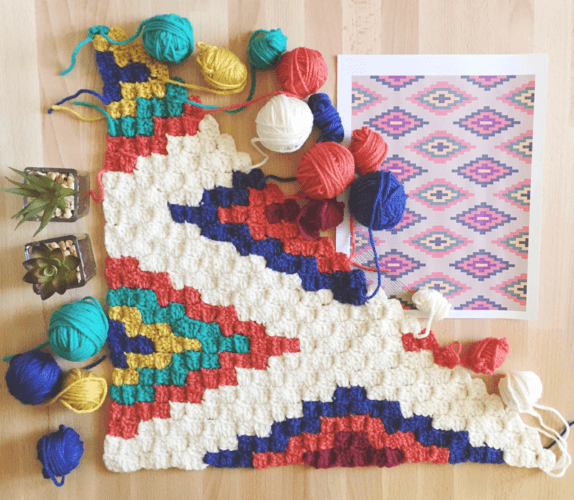 Considered a Southwestern style of crocheting, the C2C pattern is a work of genius. The design is perfect for a variety of projects. Any brand of worsted weight yarn. You can pick any set of colors you like. About 900 to 1100 yards or 823 to 1006 meters of yarn should suffice. A U.S size 8 or 5.0mm hook. 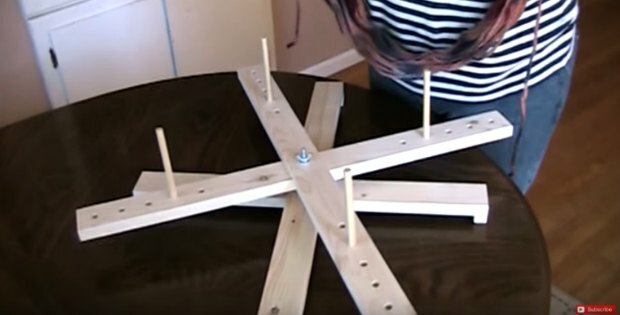 Although this design does look like a challenge, once you get going it’s very easy. This pattern is in the form of a downloadable graph so that you can emulate the afghan style of the throw. It assumes that you already know how to create a basic corner to corner style. If not, then you can watch the video below for a demonstration. After a couple of lines, you’ll have gotten the hang of corner to corner crochet. The hardest part of this pattern will be handling all of the yarn. After a while, however, it won’t be as big of a deal as you would expect of a pattern of this skill level. I set out to create a few pieces using the corner to corner crochet shortly after getting my hands on the PDF document. My sister-in-law only recently gave birth to a beautiful baby girl, and a baby blanket was just what I had in mind. The initial plan was to crochet up three pieces, but after the third one, I just couldn’t stop. Two days later and yards upon yards of yarn, I had five stunningly beautiful crochet baby blankets. I used the color pink alongside a few other colorful shades. The result I must admit was better than I anticipated. From time to time, I surprise even myself with my crochet skills. You know those projects you’re sure are going to come out lovely but go on to look better than you imagined? The corner to corner crochet pattern is precisely that. Never before have I encountered such beauty, such intricate detailing, and comfort. I’m confident the little girl will love the blankets. The material I used was soft and delicate enough to avoid irritating the baby’s sensitive skin. It is recommended to use yarn that is rated as being safe for babies and one that is soft and washable as well. Baby blankets aside, I have also recently used the corner to corner crochet pattern to create a warm throw blanket for myself. I have developed this habit of staying up late either catching up on episodes of my favorite television shows or to simply read a good book. It can get quite chilly, too chilly for my liking and so I needed to knit up something to keep me warm. I have this method of determining whether or not my crochet projects are a success. Here’s what I do, I finish a new project, say a blanket or an afghan then leave it lying around. Knowing full well that my teenage daughter will come across it at some point. She has impeccable taste in fabrics and fashion in particular which I use to my advantage. If the ice queen shows the slightest interest in my blanket, then I can confidently assert that my efforts yielded great results. So far, I have been on a winning streak thanks to the corner to corner crochet pattern. If the idea of the Corner to Corner crochet is new to you, don’t worry. Once you get the idea it’s easy! Check out this step by step picture tutorial on the Craftsy blog about how to get started in C2C crochet. Or watch this video below in which everything is explained. 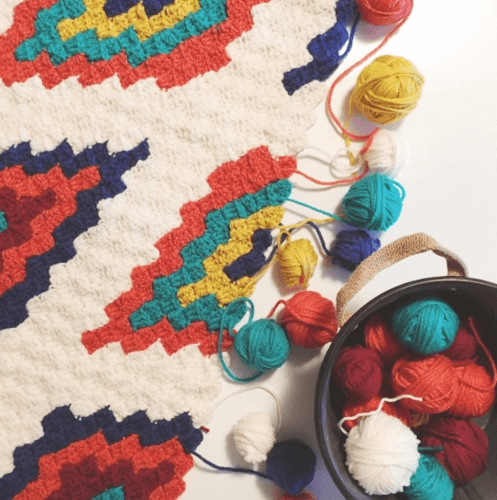 This southwestern crochet pattern is by ‘Stuff Steph Makes‘ and she provides the free downloadable PDF which is only a graph.